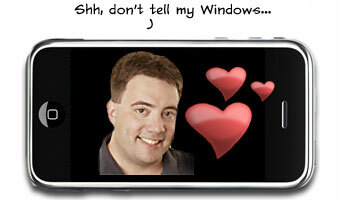 Windows Mobile Team Says iPhone Success Validates WinMo?! Our sibling site, WMExpert's tells us about all the speculation surrounding code-name "pink", which may have to do with some manner of next generation Windows Mobile stuffs. (We've heard whispers of "rouge" as well, so we're guessing there're some real "Lady Marmalade" skunkworks going on). What thinks noted Windows pundit Paul Thurrott, who has made a side career absolutely annihilating Windows Mobile as of late? As much as he loves Vista and Windows 7 and everything else Microsoft (Internet Explorer rightfully excluded), and as much as he bashes and baits all things Apple, iPhone user Thurrott has been saving his most impassioned rants of late for Windows Mobile. The latest? Yep. [News that Windows Mobile 7 may not hit the market until 2010] is bad. Microsoft is working on a number of things before that major update, Windows Mobile 7. These include a new version of the WM version of IE, called Internet Explorer 6, and a new Windows Mobile platform called Zune Mobile that includes Zune functionality. But it’s not happening quickly enough. Really? 3+ years after Steve Jobs hit the stage at Macworld 2008 and pulled the original iPhone from his pocket isn't quickly enough? That's how long it takes to even begin a response? "Pink" aside, is there no sense of urgency in Redmond? No desire to step up their game in the face of the iPhone walking in, stealing their mind share, and smacking around their market share? I wanted to at least mention one thing I found vaguely alarming. When asked about the success of the iPhone and how that impacts Windows Mobile, I was told that the iPhone “validated” Microsoft’s approach. That’s some weird combination of revisionism, wishful thinking and, perhaps, delusion.